Every time Déluc Silar walked home from he work he saw orphans living on the street. These children were being physically and sexually abused as they tried to find food and water to survive. Hoping to save one life, he took an abandoned child into his home in 2008. Then he took a second, and then a third, and his heart would ache for every child he saw on the street. By 2009, Déluc and his wife were living with 15 kids! They moved into a larger home using financial gifts from people in the community. When the 2010 earthquake struck over 300,000 people were killed… leaving many more orphans. Déluc is now a father to about 70 children ranging in age from 2 to 16. His home provides love, shelter, food, and education for these kids. He is literally saving lives. Purchasing the land from the original property owner for $55,000 so Déluc Silar owns the property free and clear. Building up the Institution Mixte Frère Silar, a school for the orphans along with other kids in local community. Adding a second and third story on the home. Providing five bio-sand water filters. The property has a well, but the water was not drinkable. Offering summer camps for the children. We love this project and will continue to support it because it is a great example of a project that was conceived by Haitians and is operated by Haitians. While it is always exciting to fund “new projects”, it is equally important to financially support Haitians who are doing things right (and doing the right thing). There are approximately 70 kids under Déluc’s care and the facility’s operating costs are approximately $50,000 per year. The money being raised for the orphanage goes towards food, education, and medical care for the children in the program, plus the rent on one piece of property and structural improvements on another. Please consider a recurring gift to support the ongoing operations costs of Déluc. 100% of your AFF donation will be sent to Déluc to support his school and orphanage. AFF doesn’t just fund projects! 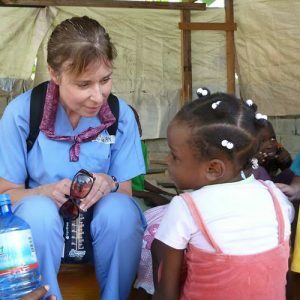 We take several trips a year to visit our partner sites and project leaders in Haiti, bolstering them with skilled medical volunteers, supplies, and training. If you would are interested in visiting Déluc and his “huge family” email jeff.clark@affhope.org.